Entry No. 238, Sinningia 'Matt Hudson', exhibited by Tim Tuttle. Score: 94. First Place. Entry No. 239, Sinningia 'Kevin Garnett', exhibited by Tim Tuttle. Score: 91. Second Place. Entry No. 165, Sinningia eumorpha 'Saltao' x S. piresiana, exhibited by Peter Shalit. Score: 85. Third Place. Entry No. 438, Sinningia 'Pristine', exhibited by Charlene Marietti. Score: 83. Honorable Mention. Entry No. 437, Sinningia 'Kristine', exhibited by Charlene Marietti. Score: 78. Entry No. 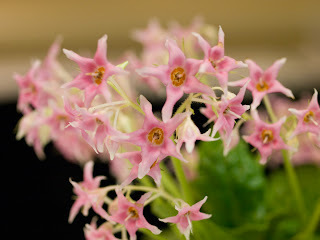 243, Gesneria 'Ako Cardinal Flight', exhibited by Nancy Kast. Score: 98. First Place. Entry No. 305, Gesneria christii, exhibited by Paul Kroll. Score: 95. Second Place. P.S. I love Ako Cardinal Flight! 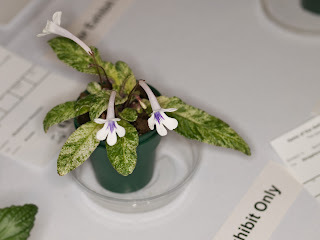 Today I'm just going to point you to The Gesneriad Society's website where you can see gorgeous photos of the blue ribbon winners. Check out the close up of Streptocarpus 'Dale's Scarlet Macaw' (Class 31C, exhibited by Gail Gray), the velvety symmetry of Petrocosmea forresttii (Class 36A, exhibited by LaDonna Hopson), the strange flowers of Boea hemsleyana (Class 32A, exhibited by Nancy Kast), and the list goes on. Why not take a look at the winners from past Conventions, too? Entry No. 495, Aeschynanthus humilis, exhibited by Lyndon Lyon Greenhouses, Inc. Score: 95. First Place. As commented on the judging, eye-catching! 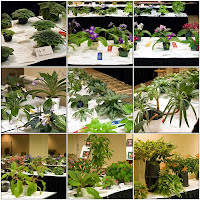 SECTION of The Gesneriad Society Convention Show. Exhibitor must provide a white card (not to exceed 8-1/2"◊11") giving educational information such as name of hybridizer, collector, place of origin, special cultural requirements. Entry No. 242, Diastema sp. 'Red Falls', exhibited by Tim Tuttle. Score: 91. First Place. Entry No. 506, Rufodorsia minor, exhibited by Nancy Kast. Score: 83. Second Place. Entry No. 429, Paradrymonia ciliosa, exhibited by Olive Ma Robinson. Score: 77. Third Place. Rufodorsia minor, native to Costa Rica, Panama (per the Checklist). For a photo of seed pod, see the Fruits and Seeds section of Prof. Dr. Anton Weber's article available on the The Gesneriad Reference Web. Paradrymonia ciliosa, native to Brazil, Colombia, Ecuador, French Guiana, Guyana, Peru Suriname, Venezuela (per the Checklist). Entry No. 144, Columnea 'Eewun', exhibited by Lynn Cook and Troy Ray. Score: 94. First Place. Entry No. 426, Columnea sanguinea, exhibited by Olive Ma Robinson. Score: 92. Second Place. Entry No. 427, Columnea lehmannii, exhibited by Olive Ma Robinson. Score: 92. First Place. Entry No. 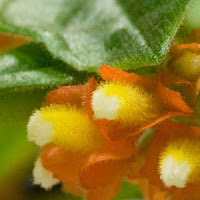 140, Columnea orientandina, exhibited by Carol Hamelink. Score: 90. Second Place. Entry No. 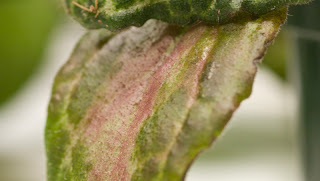 347, Columnea minutiflora, exhibited by Carol Hamelink. Score: 88. Third Place. We're running something of a special. 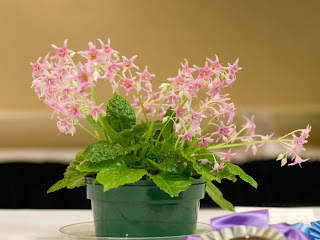 Join the National Capital Area Chapter of The Gesneriad Society now, and your one year membership fee will be good through the end of 2010. Sign up at the Convention or mail in this application form. Entry No. 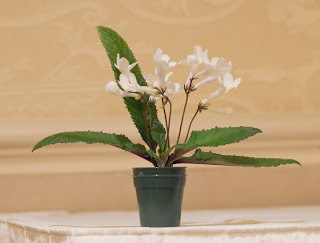 405, Petrocosmea begoniifolia, exhibited by Nancy Carr. Score: 90. First Place. Entry No. 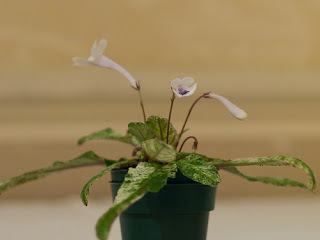 246, Petrocosmea minor, exhibited by Nancy Kast. Score: 88. Second Place. Entry No. 446, Petrocosmea species #5, exhibited by Paul Lee. Score: 87. Third Place. Entry No. 396, Petrocosmea flaccida, exhibited by Nancy Carr. Score: 88. Third Place. Class 57 "Textile Museum" - A foliage only arrangement emphasizing color, pattern and/or texture. Niche size: 8"H ◊ 8"W ◊ 8"D.
Entry No. 420, Textile Museum, exhibited by Olive Ma Robinson. Score: 92. First Place. Entry No. 266, Textile Museum, exhibited by Karyn Cichocki. Score: 91. Second Place. Entry No. 198, Textile Museum, exhibited by Neale W. Stuart-Merriman. Score: 85. Third Place. Entry No. 204, Textile Museum, exhibited by Lee Stradley. Score: 79. Honorable Mention. Class 56 "Kite Festival" - Whether flown singly or in tandem, the multishaped fliers attract attention with their swooping and soaring. Your interpretation in a mobile design. Niche size: 24"H ◊ 16"W ◊ 12"D.
Entry No. 181, Kite Festival, exhibited by Judy Zinni. Score: 91. First Place. Entry No. 265, Kite Festival, exhibited by Karyn Cichocki. Score: 89. Second Place. Class 53 "Folger Shakespeare Library" - Your interpretation of any of the bard's works (supply title). Skulls permitted. Niche size: 12"H ◊ 12"W ◊ 12"D.
Entry No. 453, A Midsummer Night's Dream, exhibited by Mel Grice. Score: 94. First Place. Entry No. 177, Love's Labour Lost, exhibited by Barbara Festenstein. Score: 80. Second Place. Entry No. 196, A Midsummer Night's Dream, exhibited by Neale W. Stuart-Merriman. Score: not scored. Class 52 "International Spy Museum" - Light and dark with shades in between will define this twin arrangement. Niche size: 18"H ◊ 18"W ◊ 18"D.
Entry No. 195, International Spy Museum, exhibited by Neale W. Stuart-Merriman. Score: 97. First Place. Entry No. 176, International Spy Museum, exhibited by Barbara Festenstein. Score: 95. Second Place. Entry No. 418, International Spy Museum, exhibited by Olive Ma Robinson. Score: 92. Third Place. Entry No. 297, Chirita 'Louisa', exhibited by Carolyn Conlin-Lane. Score: 96. First Place. Entry No. 226, Chirita sinensis x longgangensis, exhibited by Jay Sespico. Score: 90. Second Place. Entry No. 296, Chirita 'Elyse', exhibited by Carolyn Conlin-Lane. Score: 88. Third Place. Entry No. 364, Streptocarpus 'Heartland's White Gold', exhibited by Brian Connor. Score: 87. Honorable Mention. Entry No. 124, Chirita 'Hisako', exhibited by Carol Hamelink. Score: 95. First Place. Entry No. 389, Chirita sinensis 'Angustifolia', exhibited by Richard G. Carr. Score: 89. Second Place. Entry No. 512, Chirita 'Naine Argente', exhibited by Kristina Schmid. Score: 85. Third Place. Entry No. 302, Chirita sinensis 'Hisako', exhibited by Betsy R. Sherwin. Score: 70. Entry No. 158, Sinningia 'Ozark Red Lightning', exhibited by Doris Brownlie. Score: 93. First Place. Entry No. 237, Sinningia 'Heartland's Double Dilly', exhibited by Tim Tuttle. Score: 90. Second Place. Entry No. 432, Sinningia 'Ozark Rosy Cheeks', exhibited by Charlene Marietti. Score: 88. Third Place. Entry No. 507, Sinningia hybrid, exhibited by Carolyn Conlin-Lane. Score: 84. Entry No. 414, Sinningia 'Super Orange', exhibited by Nancy Carr. Score: 82. Entry No. 185, Amalophyllon clarkii, exhibited by Jo Anne Martinez. Score: 97. First Place. Entry No. 434, Amalophyllon rupestre, exhibited by Charlene Marietti. Score: 93. Second Place. Entry No. 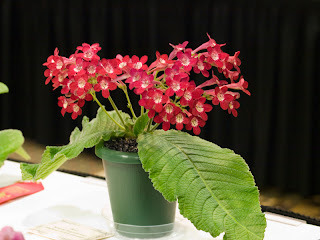 249, Pearcea hypocyrtiflora, exhibited by Nancy Kast. Score: 97. First Place. Entry No. 223, Pearcea, exhibited by Jay Sespico. Score: 90. Second Place. Entry No. 122, Gloxinia 'Dragonsong', exhibited by Carol Hamelink. Score: 86. Third Place. Gloxinia 'Dragonsong' is one of quite a few hybrids by local chapter members. Jim Roberts wrote about this cross in the March 2007 issue of Petal Tones. Entry No. 166, Kohleria 'Peridot's Mango Martini', exhibited by Kathy Spissman. Score: 95. First Place. Entry No. 130, Kohleria 'Manchu', exhibited by Carol Hamelink. Score: 92. Second Place. Entry No. 134, Kohleria 'Snakeskin', exhibited by Carol Hamelink. Score: 85. Third Place. Entry No. 146, Kohleria 'Snakeskin', exhibited by John Boggan. Score: 82. Honorable Mention. Entry No. 136, Kohleria 'Texas Rainbow', exhibited by Carol Hamelink. Score: 75. Entry No. 348, Kohleria 'Emily Roberts', exhibited by Carol Hamelink. Score: 75. Entry No. 475, Chirita dielsii, exhibited by Bill Price. Score: 95. First Place. Entry No. 252, Chirita subrhomboidea, exhibited by Nancy Kast. Score: 91. Second Place. Entry No. 102, Chirita heterotricha 'Chastity', exhibited by Bev Promersberger. Score: 87. Third Place. Entry No. 254, Chirita spadiciformis, exhibited by Nancy Kast. Score: 85. Honorable Mention. Entry No. 101, Chirita sp. USBRG 98-083, exhibited by Bev Promersberger. Score: 83. Entry No. 344, Chirita gemella, exhibited by Sylvia Taub. Score: not scored. 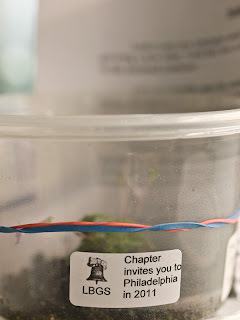 One of the reasons to go to a plant event like the Convention is the peripheral benefit of a sudden increase in curiosity - requiring immediate reading. One such question for me - how long to bloom for Streptocarpus dunnii, known as a large unifoliate red, and one of the parents of Streptocarpus Dale's Scarlet Macaw (this year's Best New Registered Hybrid, a Dale Martens creation)? I just came across The Gloxinian, Vol. 52, No. 2 (second quarter 2002) in which Alan LaVergne reported on growing 13 unifoliate Streptocarpus species from seed to bloom. S. dunnii clocked in at 41 months. 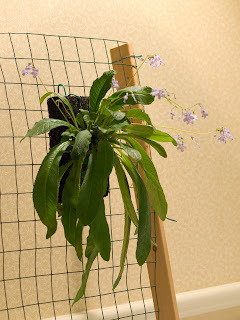 The Gesneriad Reference Web has a spectacular photo of it in situ. Entry No. 314, Nautilocalyx glandulifer, exhibited by Paul Kroll. Score: 94. First Place. Entry No. 258, Sinningia reitzii, exhibited by Karyn Cichocki. Score: 93. Second Place. Entry No. 313, Corytoplectus cutucuensis, exhibited by Paul Kroll. Score: 92. Third Place. Entry No. 358, Pearcea hypocyrtiflora, exhibited by Stephen Maciejewski. Score: 91. Honorable Mention. Entry No. 147, Kohleria 'Pink Shadows', exhibited by John Boggan. Score: 91. First Place. Entry No. 133, Kohleria 'Green Goblin', exhibited by Carol Hamelink. Score: 90. Second Place. Entry No. 325, Kohleria 'Peridot's Kitlope', exhibited by Emma Bygott. Score: 82. Third Place. Entry No. 142, Kohleria 'Jester', exhibited by Carol Hamelink. Score: 80. Entry No. 135, Kohleria 'Lemon Demon', exhibited by Carol Hamelink. Score: not scored. Entry No. 175, Kohleria 'Marquis de Sade', exhibited by Barbara Festenstein. Score: not scored. Entry No. 433, Kohleria 'Kapo', exhibited by Charlene Marietti. Score: not scored. Entry No. 123, xSinvana 'Mount Magazine', exhibited by Carol Hamelink. Score: 92. First Place. This is (Sinningia conspicua x Paliavania tenuiflora). You can read a little about this cross here. Entry No. 425, Nautilocalyx antioquensis, exhibited by Olive Ma Robinson. Score: none (there was no flower at the time of judging, and this is an "in flower" class). A species from Colombia (Antioquia). Class 39 - Other Gesneriad Hybrids, in SECTION E - Gesneriads Grown for Ornamental Qualities Other Than Flowers - Decorative fruit and calyces are permitted, but no flowers or buds showing color. A plant should have some special quality of color, texture or growth habit to be entered in this section. Entry No. 245, Columnea 'Frosty Hills', exhibited by Nancy Kast. Score: 93. First Place. Entry No. 359, Smithiantha hybrid, exhibited by Stephen Maciejewski. Score: 84. Second Place. Entry No. 285, Kohleria 'Silver Feather', exhibited by Paul Susi. Score: 78. Third Place. What is this Conandron that won Best in Show? Is it one of those alpines? What follows is basically the results of my web research. There should be more information available, especially in Japan, China and Taiwan. Conandron ramondioides Siebold et Zucc. var. taiwanensis Masam. And now for photos. This page shows it growing on a rock wall in Kamakura, some 60 km / 37 miles south of Tokyo on the coast. And on this page (if you scroll down) are more photos of it on a rock wall on the grounds of Tokeiji Temple, in Kita(north)-Kamakura, which is further inland but still at a fairly low elevation - it's about a 40 min walk up to the top of a nearby "mountain" of 150m (500ft). According to this (blog) page, it is f. pilosus that grows around Kamakura, blooming about a month earlier than the non-hairy variety. 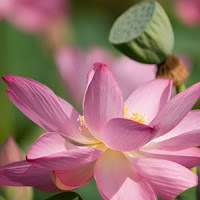 However, in cultivation, the bloom period is reportedly about the same. Blooms in mid-May to early June means that it flowers before the rainy season arrives in full force, and before the real summer heat. Here is the non-hairy form growing with ferns on rocky walls in Shinji-cho, which is across Shinji Lake from Matsue City in Shimane Prefecture. That's on the coast of the Japan Sea, some 780 km west (485 miles) of Tokyo. What a coincidence, I was there briefly last year (but no gesneriaceae sightings...). This page says that its range is from Fukushima (290 km / 180 m north of Tokyo) to the southern island of Kyushu. Other pages report this to bloom in July and August, in cool, shady spots. There are many more photos online, many without specific location information. Both Shinji-cho and Kamakura are coastal areas, with very hilly terrain not far from the coast. The photographs are from locations slightly inland, but not so far as to be into the hilly terrain. Having spent only a couple of days in each place, I can't speak to the climate but I recall Kamakura being very wet and humid, whereas in Matsue I saw layers upon layers of low altitude cloud cover. Oh, and I guess it was raining when I was there. But some actual weather data would help. 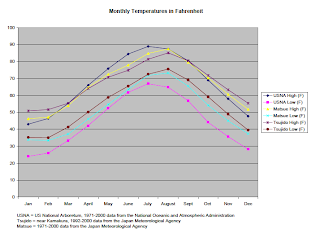 Here are comparative monthly high and low temperatures for Matsue, Kamakura (actually a little further south and on the coast, Tsujido), and DC. For a legibly-sized PDF of these (including metric measurements), click here. Of course, we should keep in mind that these are averages. Also, the weather stations are (presumably) located where they are functional, and not near rocky hillsides with foliage cover, and the topography indicates significant microclimates in both Kamakura and Matsue. From the temperature data, we can see that DC is colder and is the only location among the three that dips below freezing. (Snow has been recorded in Matsue: greatest recorded was 20 cm annual snowfall.) Also, the difference between the highs and lows is greater throughout the year in DC. 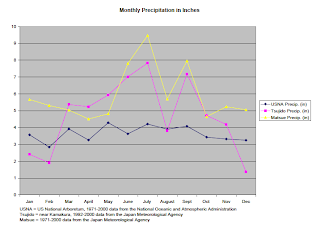 The precipitation patterns in the two Japanese locations show a rainy season in June and July, when temperatures are also rising, but not quite as hot as August. (In DC, the July average temperature is highest.) By August, precipitation is dramatically lower. In contrast, precipitation in DC is relatively steady throughout the year, ranging between 2.8 and 4.4 inches. Total annual precipitation: DC 1.11 m (43.70"), Tsujido 1.45 m (57"), Matsue 1.81 m (71.23"). For Matsue, I found the following relative humidity numbers (Jan to Dec. 1971-2000 averages, also from the Japan Meteorological Agency): 75, 74, 73, 72, 73, 80, 82, 79, 80, 78, 77, 76%. As noted above, the distribution ranges further north and south, and so it may be tolerant of lower or higher temperatures. C. var. 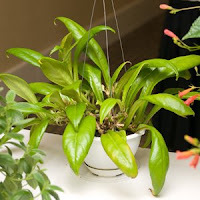 taiwanensis (ryukyuense) hails from Taiwan, China and Iriomote (second largest island in Okinawa), and is likely more heat and humidity tolerant - however elevation and other information would be helpful. Pictures from Taiwanese web addresses here, here, here and here. And they have a nice lecture program - the November one sounds very interesting. Some photos of the show room, for starters. More individual shots will be coming soon. Click on the image to go to my photo album on flickr. 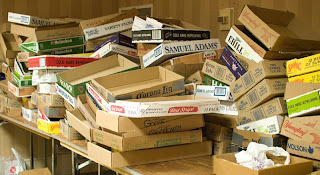 The best way to view is probably by slideshow if your computer and bandwidth will allow - there's a link to click toward the upper right of the album page. Gail Gray won Best New Registered Hybrid with Entry No. 186, Streptocarpus 'Dale's Scarlet Macaw'. This is a cross by Dale Martens between S. 'Texas Hot Chili' and S. dunii, registered in 2008. 'Texas Hot Chili' is S. ('Joker' selfed) x self. Peter Shalit explained during his lecture that Deco and Patina are siblings, and the primary distinguishing characteristic is that Chirita 'Patina' has red hairs on the leaves, giving it a "patina" in the right light. Here's a closer look at a leaf, and the hairs. What an incredible convention! Initally I was hoping for 150+ horticulural exhibits in the flower show. I never dreamed there would be over 250! 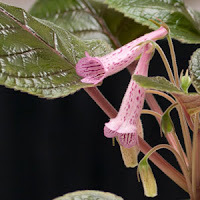 Or that I would see so many rare gesneriads like Boea hemsleyana, Conandron ramondoides, Pearcea hypocyrtiflora, Chirotopsis repanda, Chirita dielsii and a new Diastema (probably) species in flower. There were a number of spectacular Columnea, Sinningia, Streptocarpus, Kohleria, Chirita and Petrocosmea....a few giant Aeschynanthus and Alsobia as well. WOW! Our own Carol Hamelink, John Boggan as well as Nancy Kast, Tim Tuttle, Bill Price and many others showed fantastic plants. Other highlights for me were the GHA (Gesneriad Hybridizers Association) meeting, Tim's Petrocosmea lecture and Mauro's Sinningia talk. I had no idea so many Sinningias are near extinction in their natural habitat. 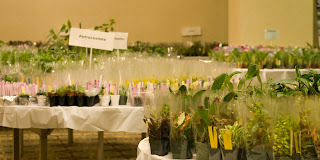 It was great meeting and talking in person to so many gesneriad growers from all over the US and Canada. As we were breaking down the show, I was chatting with Dale Martens about the small Strepts. She gave me a leaf to propagate from 'HL Baby Egrets' and some flowers/pollen and suggested a cross between 'HL White Gold' and 'HL Baby Egrets'. I am giving it a shot. 'Baby Egrets' has Strept 'Nerys' as a parent I believe. Pictured is 'HL Boyish Grin' on the left, then Aeschynanathus splendidus (with a bit of Columnea 'Midget'). Here's a photo of Dale Martens' new hybrid, mentioned in Larry's post below. For size - the paper to the left of the plant is a show entry card, about 4" wide. It was a nice flat rosette a couple of days earlier (see second photo), when it was on display at the GHA meeting. 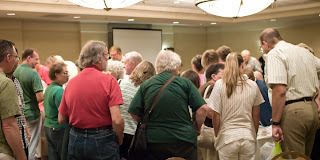 The Saturday lunch was highlighted by the live auction which netted the Gesneriad Society's Elvin McDonald Research Endowment Fund several thousand dollars. The highest selling item was basket of Streptocarpus leaves, including Dale Marten's new 'Heartland's Snowbaby', which went for $300. Other high selling items were: a cutting of Chirita linearifolia 'Variegated" that went for $265; a plant of Chirita minutimaculata for $175, and many plants went for more than $100, including show plants, like Chirita dielsii and Conandron ramondioides. Most of the attendees went to the all-you-can-eat buffet of seafood, and then strolled along the walk next to the water after dinner. Even before the main event, there were fireworks going off all around us at the restaurant. We saw the beginning of the fireworks at the Mall before heading back by bus to the hotel. Conandron ramondioides, shown by Bill Price. Shown here is a Streptocarpus johannis (JT-04-06) growing on a tree fern slab. Entered in the Show by Bob Stewart of Massachusetts. I forgot to ask him about it, but I think this might be same plant that was in a photo I saw a few years back? It certainly looks happy and I like how it displays. The Convention is concluding today and the Show was taken down this afternoon. More reports and photos are on the way - stay tuned. Peter had pictures of some newly discovered species, and some species and cultivars that are in cultivation in Asia, but not here in the States. All I have to say is...wow. Unfortunately I don't have any of the pictures to share with you, but what was most amazing about them was the flower forms and shading, they showed far greater variation in coloration and flower shape than I've seen in the varieties typically sold in the U.S. One even looked like small yellow bells! He then discussed the various sub-groups of Chiritas, the section Gibbosaccus, Annuals (section Microchirita), and Miscellaneous (section Chirita). 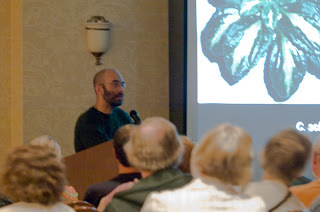 He also discussed propagation, hybridizing, and his own hybrids. The Gibbosaccus or "Leather-Leaved Chiritas" are what usually comes to mind when you think of chiritas, the smallish rosette-shaped plants with flowers tending to lavender and white. Peter had some beautiful slides of some of the new introductions. Annual Chiritas are true annuals, living about a year or so. I hadn't known they existed, but based on Peter's slides, many of them are lovely and very worth growing! 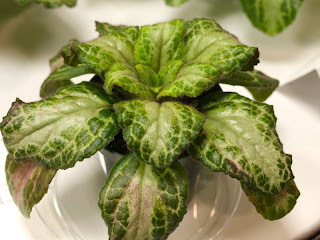 Getting your hands on these is more difficult than obtaining the Gibbosaccus types, especially as they must be propagated by seed, but Peter recommended obtaining seeds from The Gesneriad Society seed fund. The Miscellaneous group included some real show-stoppers, particularly C. walkerae, C. moonii, and their hybrid, C. 'Moonwalker'. These are tall, shrubby plants with large lovely blue/violet flowers that to me resembled thunbergia blooms. I even bought a Moonwalker, which Peter says needs more sun than most Chiritas. Surprisingly, he mentioned that C. tamiana may not even be a Chirita at all, that its proper genus is currently subject to some debate. Peter gave us some tips on propagation, the ones that stuck in my mind were: (1) that the soil can and should be fairly dry. He showed potted leaves and their soil was far drier than that I've typically used for, say, violets. As he explained, this helps solve the problem so many of us have, that the leaf rots before sending up plantlets. (2) He also mentioned that when he puts down leaves, it's not unusual to get 20 plantlets! Peter also discussed his hybridizing process and some of his hybrids. Chirita seed pods take 1-2 months to ripen, and then 8-12 months from seed to bloom. Interestingly, many of the plants have juvenile forms that are different than their mature forms. I was not familiar with many of the hybrids he showed, but the one I liked the best was 'Deco.' Its leaves are almost oval or round, and very silver, and to me its flowers looked particularly elegant. I haven't done Peter's talk justice, but really it was great, and if he's ever giving a talk in your area, go see it! It was a measure of how great it was that after his talk the Chirita table in the show room was totally mobbed! Today was great and I'm looking forward to tomorrow! cards, checking for thirsty plants etc.